In America, it’s easy to get a feel for Apple’s success. Just go to any public place and look around at all the iPhones. China is a different story; there, Apple remains a luxury brand, not a mainstream powerhouse. And even as China becomes a bigger source of Apple revenues, it is still in many ways a country of unrealized potential and unique challenges. As Apple embarks on its 2014 fiscal year, we take a look at the company’s past successes and failures there, as well as what to expect in the future. Apple’s performance in China is tricky to measure. Until 2013, Apple didn’t distinguish its sales in Greater China—that is, mainland China, Taiwan, and Hong Kong—from the rest of the Asia Pacific region. Still, we can get a sense of how Apple has performed by piecing together the company’s sales figures, public statements, and milestones over the past few years. For Apple, the real action began in late 2009, when the iPhone 3GS officially went on sale through China Unicom, which, despite an impressive 140 million subscribers, is only the country’s second-largest wireless carrier. This was the first real foot in the door for Apple: The iPod and the Mac had never been strong sellers in China, and previous iPhone models were only imported or sold on the gray market. In those early days, the iPhone had a few challenges working against it: It was an expensive and hard-to-find product, and it was crippled due to local regulations that prohibited it from using Wi-Fi. Sales were slow at first; it took over a month for China Unicom to sell 100,000 iPhones—that’s compared to the 1 million units sold across eight other countries on the iPhone 3GS’s opening weekend alone. 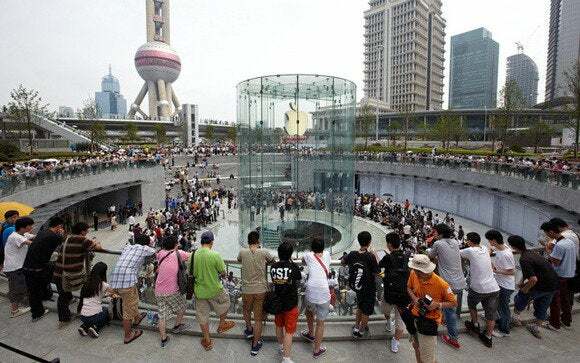 Apple has a dozen retail stores in China, including this one and three others in Shanghai. But sales ramped up quickly as Apple added more distribution points in China for its new iPhone, along with a second Apple Store in Shanghai in July 2010. (Apple’s first store, in Beijing, had opened two years earlier.) In Apple’s first two quarters of the 2010 fiscal year, its revenue in China more than doubled, to $1.3 billion. And when the iPhone 4 went on sale in October 2010, Apple hit the 100,000 sales mark in China within just four days. All the while, China’s middle class was expanding, with more disposable income to spend on Apple products. Nicole Peng, research director for China at Canalys, said that Apple was seen as a status symbol for the wealthy before, but over time the company established itself as an “affordable luxury” brand. Apple’s attention to China was beginning to have a major impact on the company’s earnings. In 2009, the entire Asia Pacific region brought in just $3.18 billion. The following year, annual revenue jumped to $8.26 billon, and in 2011, Asia Pacific revenue reached $22.5 billion—a more than 600 percent increase in two years. And by the fourth quarter of 2011, roughly 70 percent of that revenue was coming from China. Over those two explosive years, China grew from 2 percent to 12 percent of Apple’s total earnings, as Chinese customers got caught up in the Apple craze. When the iPhone 4s launched in China in January 2012, it created such a frenzy that one Beijing store was forced to close, and SWAT teams had to step in to keep the peace. Those days of jaw-dropping growth didn’t last forever. At first, in every quarter after 2010, Apple’s Asia Pacific revenue at least doubled year-over-year. But in 2012, Apple’s revenues doubled only in the second quarter, when China Telecom, the country’s third-largest carrier, began selling the iPhone 4s. China sales continued to slow in 2013. In the first three quarters, China revenue was $19.7 billion—just a 15 percent increase over the previous year. Apple’s biggest spike came in the first quarter, when the launch of the iPhone 5 helped boost revenues by 67.4 percent; but in the quarters that followed, earnings increased by just 7.5 percent and then fell by 13.9 percent. Meanwhile, Apple’s smartphone and tablet market share has been shrinking in China. Estimates provided to Macworld by Canalys show that with every new iPhone model through the end of 2011, Apple’s market share in China spiked to increasingly higher levels, peaking at 18.9 percent with the iPhone 4s. But since then, Apple’s share has tapered, and the launch of the iPhone 5 late last year brought only a 0.6 percent boost, bringing its share to 8.5 percent of China’s smartphone sales. In the third quarter of 2013, Apple’s share fell to 4.8 percent—its lowest level in three years. As for the iPad, IDC said in August that Apple’s quarterly market share fell to 28 percent, down from about 50 percent the year before. In Apple’s third-quarter earnings call, CEO Tim Cook blamed the slower sales partly on economic factors. But a look at the competition is telling: Apple’s products are being outsold by less expensive devices. Last quarter, competitors such as Samsung, Lenovo, ZTE, Yulong, and Huawei all outsold Apple in smartphones, according to estimates from Canalys. The pattern is similar to what we’ve seen in other parts of the world, where “good enough” phones and tablets are gobbling up Apple’s market share. 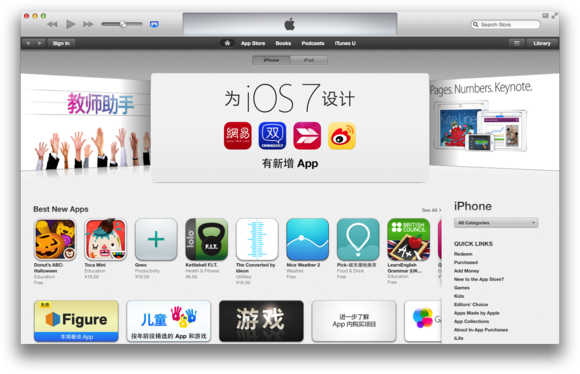 The Chinese version of the iTunes Store offers much less content than, say, the U.S. store. It’s worth noting that Apple has one big disadvantage in China that doesn’t apply in markets like the United States: Customers in the country aren’t as locked in to the Apple ecosystem. It’s a much different situation than in the United States, where Apple’s reputation for having the best apps and the most content keeps users hooked. Ronan de Renesse, principal analyst for Analysys Mason, noted that Apple’s version of iTunes in China offers only apps and ebooks, and unlike in the U.S. and elsewhere, Apple can’t simply build on a decade of consumers using iPods. Alternative app stores abound, including pirated versions of iTunes; and according to analytics firm Umeng, 30 percent of iPhone users in China jailbreak their devices. The customers who do want to use iTunes face roadblocks: As Bloomberg Businessweek points out, service can be slow because servers aren’t based in China, and Apple only added the ability to pay with local currency a couple of years ago. Carrier billing still isn’t an option. “The cost of ramping up iTunes and enforcing the content lock-in in China would be very high for Apple and would not guarantee results,” de Renesse said. He believes Apple can find other ways to boost sales and be successful in China even with a small percentage of the market. Analysts are now hoping for a few quick jolts to Apple’s fortunes. In a first for the China market, the iPhone 5s and 5c were available in the country at launch, instead of being delayed by several months; the same is true of the iPad Air. Although the 5c isn’t much different from the iPhone 5 on the inside, it does have some of the appeal of a new product, and it’s reportedly being sold at a discount by some retailers in China, just as it is in the United States. 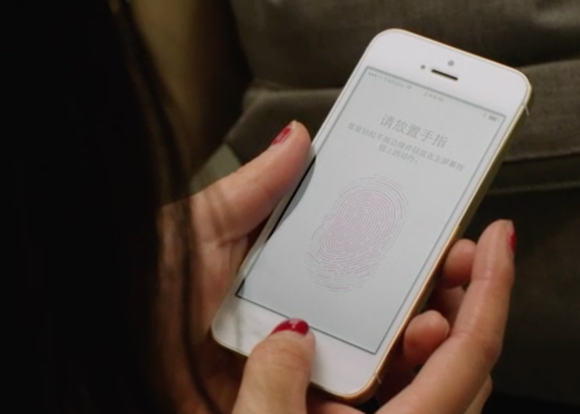 The iPhone 5s and 5c are the first iPhones to launch in China on day one. Those product releases are looking to bolster Apple’s bottom line in China. In the fourth quarter of 2013, the company’s revenue in the region rebounded slightly, bringing in $5.7 billion. That’s up 6 percent year-over-year and 24 percent over the previous quarter. It’s also significant, as Barclays analyst Ben Reitzes pointed out during Apple’s fourth-quarter earnings call, that Apple was one of the few tech companies to actually grow in China during the quarter. There’s also been a lot of chatter about a possible deal between Apple and China Mobile, the country’s largest wireless carrier; according to ISI, the carrier has more than 700 million subscribers, 180 million of which are 3G subscribers. Although Apple and China Mobile have negotiated for years, rumors suggest that a deal is imminent this time. “That single-handedly, we estimate, would drive 20 percent higher iPhone sales next year,” Brian Marshall, an analyst with ISI told Macworld. In the long term, the shift to 3G and 4G networks in China could also lead to more sales, if carriers try to push more long-term contracts with subsidized handsets, similar to the way the U.S. market works. In the meantime, don’t expect Apple to chase after market share with cheaper devices that diverge from its existing product line. That’s never been the company’s philosophy, even in emerging markets. “I don’t see them changing this strategy just for the Chinese market, and we’ve seen that with the iPhone 5c,” de Renesse said. Apple likely enjoys its position in China as a respected, international brand, and the price premium it commands. So despite the differences between China and the United States, the strategy isn’t all that different: Make products for which people are willing to pay, even if the pricing is higher than the competition’s.